File photo of Hermon's Speedway 95, which will hold its first race card on Saturday, May 12. Two of the state’s stock car tracks, Wiscasset Speedway and Oxford Plains Speedway, are opening for the season on Saturday but Unity Raceway will not have any racing this season as George Fernald Jr., who is leasing the track from Ralph and Nancy Nason, continues to recover from a serious brain infection that kept him out of work for seven months. 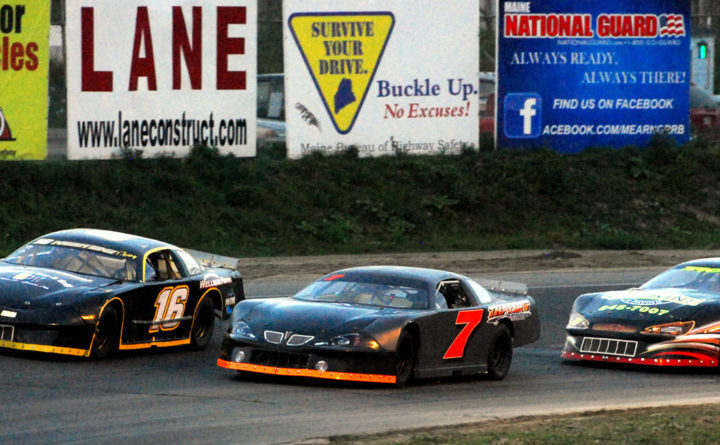 Scarborough’s Beech Ridge Motor Speedway will open on Saturday, May 5 and Hermon’s Speedway 95 will hold its first race card on Saturday, May 12. There will just one race date at Caribou’s Spud Speedway this season and that will be the Aroostook Federal Savings and Loan Firecracker 200 Pro All-Stars Series Super Late Model North feature on July 3. The 54-year-old Fernald is counting his blessings after suffering a brain infection that “almost killed me” in August. He said he is improving and has recently returned to work for Geo and Sons Mobile Homes in Benton. His health condition preempted his plans to transform the third-mile asphalt oval into a dirt track. He said the poor condition of the track and wanting to offer the state something different were his reasons for the switch to a dirt track. “The track was rough. It was chunking up underneath the cars. The drainage underneath had gone to hell,” said Fernald. They were able to grind up the track but there were several other steps that were stalled. He said there are still two layers of soil, one with gravel and another with sand, that will have to be removed before they get to the clay that they will eventually race on. Once he gets healthy enough, Fernald said he has some paperwork he needs to iron out with the Nasons before finishing the project. If he can get the project completed, he intends to again hold big enduro races on the snow this winter as he did two winters ago when the three races drew 45, 73 and 85 cars. Then he would like to hold regular races on the dirt track every other weekend next year. Ken Minott, the promoter at Wiscasset Speedway, said there have been several track improvements although some have yet to be completed due to the weather. “We’re ready, race-wise, but the weather has put us behind a couple of weeks when it comes to the facility upgrades,” said Minott. They have upgraded the lighting system, they are paving and expanding the concourse for the fans and are improving the fencing and fiberoptic/wireless capability. The eight divisions will again be divided into two groups of four and each group will race every other weekend. There will also be flex races, like the Wicked Good Vintage Racers and Northeast Classic Lites, that will added to complement the regular classes each weekend. Saturday’s racing will begin at 2. The signature events will be the Coastal 200 Late Model race on Sunday afternoon, May 27; the Boss Hogg 150 Pro Stock event on Sept, 2 and a 350 SMAC Supermodified race on Aug. 11, a first for the track according to Minott. Payouts have been raised for all the weekly divisions and the major races. The purse for the Coastal 200 will see a bump of $8,000 with the winner pocketing $5,000, which is $2,000 more than a year ago. There will be Monster Truck Throwdowns leading up to the Coastal 200 on Friday night at 7 and Saturday at 2 (May 25, 26). Oxford Plains Speedway was supposed to open last weekend but inclement weather pushed it back to this weekend and there will be racing on both days. The weekly Oxford Championship Series will kick off on Saturday at 4 with Super Late Models, Street Stocks, Bandits and Figure 8s taking the green flag. The PASS Super Late Model and Modifieds will take center stage on Sunday beginning at 2. There will also be an OCS 50-lap street stock race that will pay $500 to win. The PASS SLM North race will be the Honey Badger Bar and Grill 150 .